Trig finds her on the side of the road, barefoot and beaten, walking back to her abusive husband. 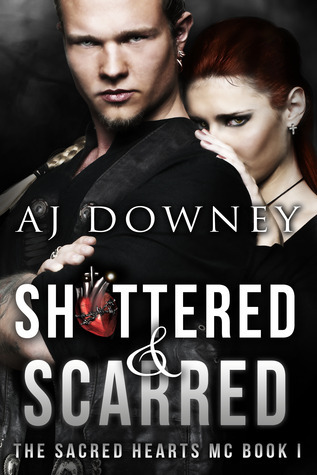 Without a second thought to the consequences, he loads her on his motorcycle and takes her to the Sacred Hearts MC Club. No woman and no children, but they allow Ashton Granger to soak up the freedom and goodness offered at the club and help Ethan “Trigger” set her up with her own place and job. They go even further for her when her husband hunts her down to inflict the correction she evaded when Trig saved her. The buildup A.J. Downey created for this romance was astounding. Downy crafted each of her characters with precision and care. They were alive and real and relatable and vulnerable. It was this vulnerability within her main characters that really pulled me into their story. Downey also has a knack with descriptions. I like how she describes everything: people especially. Shattered and Scarred was more sophisticated than the average book. The way Downey looks at a scene and describes it is fascinating. I dislike when anyone calls a woman they don’t know or hardly know, ‘baby.’ In my mind it’s usually condescending so it’s hard to get over the fact that Trig is using it as a calming/placating word. This novel was published by A.J. Downey on June 9th, 2014 and is available on Amazon here.